Performance Art - Todd Van Buskirk. Artist. Develop a spiritual practice based on the words and actions of a person, and live by what they model and project. Follow the chosen person as a disciple follows a guru. For better or for worse, this person is now your guru. The things they touch or handle are holy relics to you. A sighting of this person is a spiritual gift to you. If possible, keep a picture of their likeness for inspiration and meditation. The words they write or utter is full of meaning and mystery that teach the way of self-realization or divine enlightenment. Save this person’s writing and write down what they say for a book to be compiled and printed. Do not reveal your worship to the person, be a disciple from a safe distance. Do not intrude on their person or space. Respect the guru. In his book Difference and Repetition, Gilles Deleuze speaks of literal repetition as being radically artificial and, in this sense, as being in conflict with everything natural, living, changing, and developing, including natural law and moral law. Hence, practicing literal repetition can be seen as initiating a rupture in the continuity of life. In his remarks on the philosophy of history, Walter Benjamin also describes the genuine revolution as a break with the continuity of historical evolution, as a literal repetition of the past in the midst of the present. He also refers to capitalism as a new kind of religion reduced to ritual and so devoid of any theology. Literal repetition, however, is not only a revolution effectuated by capital or against it; that is, it is not only an act of violence against the flow of historical change, and even against life as such. Literal repetition may also be seen as a way toward personal self-sacralization and immortality—immortality of the subject ready to submit him- or herself to such a repetition. Each day wet-shaving hobbyists post on online forums to describe their daily equipment (or kit) and routine. These discussions take place on the “Shave of the Day” threads. Many participants change their rotation of brush, razor, or soap every day, or weekly as desired and post their activity on the “Shave of the Day” threads. There is a man who posts daily on a wet-shaving forum online. I do not know this individual personally. What sets this man apart is the modest, consistent and minimalistic writing style he applies for his “Shave of the Day” posts. The first line of a typical post describes the day and year of that day’s shave, the remaining four lines describe his shaving products and routine with a masterful sense of compressed description. I admire this man and have grown attached to his repetitive posts about his daily shaves. I have re-learned to enjoy the ritual of shaving. Shaving has brought me happiness and a means to transcend myself from the world, therefore, in this piece I pronounce this individual as my spiritual guru. I am his self-proclaimed disciple. He does not know he is my guru but as his disciple I preserve his writings for posterity. I respect the guru and his privacy. Guru is a Sanskrit term for "teacher" or "master", especially in Indian religions. The Hindu guru-shishya tradition is the oral tradition or religious doctrine or experiential wisdom transmitted from teacher to student. It is the tradition of spiritual relationship and mentoring where teachings are transmitted from a guru "teacher" to a "disciple" or chela. Such knowledge, whether it be Vedic, agamic, architectural, musical or spiritual, is imparted through the developing relationship between the guru and the disciple. It is considered that this relationship, based on the genuineness of the guru, and the respect, commitment, devotion and obedience of the student, is the best way for subtle or advanced knowledge to be conveyed. The student eventually masters the knowledge that the guru embodies. I view this man’s “shave of the day” posts as directions for a “puja.” A puja is a religious ritual performed by Hindus as an offering to various deities, distinguished persons, or special guests. In Hinduism, it is done on a variety of occasions and settings, from daily puja done in the home, to temple ceremonies and large festivals, or to begin a new venture. The two main areas where puja is performed is in the home and at public temples. Therefore, the morning shave is the essential spiritual practice as given by the guru. I view this man’s daily “Shave of the Day” posts as a Sutra or riddle that holds the kernel of Self-Knowledge and Enlightenment. A Sūtra is an aphorism or a collection of such aphorisms in the form of a manual or, more broadly, a text in Hinduism or Buddhism. In ancient Indian literature, sutra denotes a distinct type of literary composition, based on short aphoristic statements, generally using various technical terms. This literary form was designed for concision, as the texts were intended to be memorized by students in some of the formal methods of scriptural and scientific study. It is also traditional to have no personal interaction with the guru. The strong one-on-one education and guidance traditionally provided by the guru is now often reserved for the privileged few in various situations. Because of technology the guru may not be physically present or even alive, appearing only through videotape, photographs, or (as the case with my guru) on the internet. I don’t have a personal relationship with this man, we are not friends nor do I know anything about his personal life besides shaving. I learned my shaving kit, rotation, and mixing of lather by taking notes from the Shave of the Day posts of this man. Likewise, the guru teaches more by his example than by his words, but he teaches even more by his influence than by his example. This silent teaching is not alien to the intuitions of some Westerners; Rainer Maria Rilke writes to the "young poet": "I think so strongly about you, dear Mr. Kaeppers, and I concentrate my vows on you in such a way that this should, it seems to me, help you in some manner. On the other hand, I often doubt that my letters may give you any real support... All I wish is for you to abandon yourself with faith and patience to the action of this wonderful solitude." I collected and archived every word (and photograph) made by this man and saved the files on my computer. It is traditional for the disciple to be the compiler of his guru’s teaching, usually in the form of written dialogues between guru and disciple. The dialogue between guru and disciple is a fundamental component of Hinduism, established in the oral traditions of the Upanishads (c. 2000 BC). The term Upanishad derives from the Sanskrit words upa (near), ni (down) and şad (to sit) — "sitting down near" a spiritual teacher to receive instruction. Documentation of performance art can include photography, video, sound recording, and creative collection and display of “remnants” of performed actions left behind when the piece is complete. Documentation is often considered to be indexical; i.e. it provides proof for viewers who did not witness the live event that a particular event really occurred. Amelia Jones says: “… the role of documentation [is to] secur[e] the position of the artist as beloved object of the art world’s desires.” So, does the artist document live performance because documentation is really integral to the meaning and impact of the piece, or only in order to retain an “object” that the contemporary art world will recognize as an artistic creation? Can the documentary ever be separated from the theatrical in performance? In other words, if a performer knows that his or her actions are staged for documentation, the act of documenting becomes part of the performance, whether acknowledged or not. Consider the “ideology of photography”: photography creates an illusion of realness that our first instinct is to accept without question, even in an era where Photoshoped and retouched images are commonplace. Philip Auslander notes that seeing documentation as only a supplement to performance “reaffirms the status of the photograph as an access point to the reality of the performance.” Making documentation part of the performance piece leads viewers in real time and after the fact to question the reliability of the photograph’s representation. Another big question: What is a document anyway? If documentation of work relies on collecting information on content, context, and practice many kinds of documentary materials are needed for a full representation of each artwork. Can a document “act as a substitute for lived experience”? Or, can documentation of an artwork recreate some elements of the original performance? If the document must reflect the form of the work itself, documentation may become a new area of intellectual and artistic practice (maybe parallel to the task of the literary translator). Corina MacDonald says that documentation is becoming a “new cultural technique” that draws on many disciplines and forms, and is its own realm of expression. 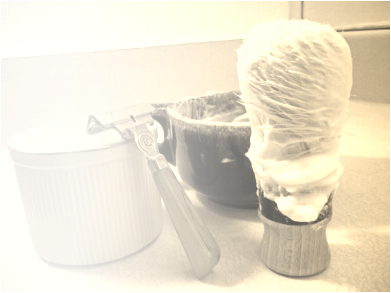 I document this piece on the blog “The Wet Shaving Conceptual Artist. ” In each post I describe every morning with text and a photograph, basing my performance on the online “Shave of the Day” posts of the man I follow as guru. I study his posts and follow his routine to the best of my ability. 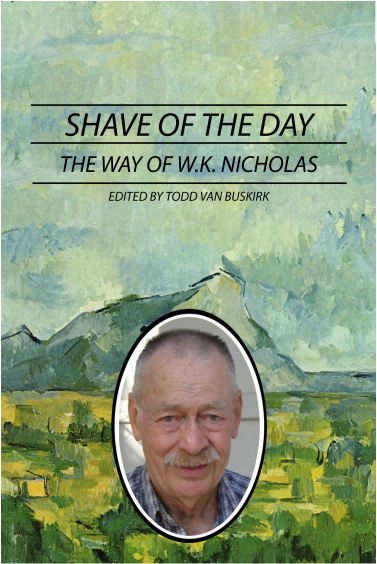 I collected and archived every word (and photograph) made by this man for re-contextualization into spiritual teachings for a book titled “Shave of the Day: The Way of W.K. Nicholas."